All four Wits volleyball teams that participated in the Shani 30 Fundraising Volleyball Tournament lost their games in the quarter-finals on Saturday, April 6 at the Wits Old Mutual Sports Hall. The three day tournament was organised by the Childhood Cancer Foundation South Africa (CHOC) and it partnered with 26 volleyball teams in Gauteng to host the tournament for men’s and women’s open and masters divisions. The Wits University Sports South Africa (USSA) men’s team, playing in the men’s open lost 2-0 against the University of Johannesburg Volleyball Club (UJVC) Men, while Wits Volleyball Club (WVC) men, who played in the open division against Aqua Delfos Super Kids lost 2-0. In the open division, the USSA women’s team flopped against UJVC women, with a 2-0 drubbing, while the Wits Club lost 2-0 against the Knowledge Advocacy Development Volleyball Club (KAD). The winners in the men’s masters division were the Aqua Delfos Super Kings who won the match 2-0 against the Green Boozers. In the women’s open, KAD beat the Quantums Volleyball Club (QVC) two sets to one. In the men’s open, two teams from the Aqua Delfos Volleyball Club played in a nail biting final. The Aqua Delfos Super Kids won against the Titans 2-1. The prize giving ceremony took place on Sunday, April 7, which started off with pink lit candles and a moment of silence for people who have lost the fight against cancer. Speaking at the prize giving ceremony on the final day of the tournament, Salo Mathen, fundraiser for Shani 30, said that her daughter, Shani, lost the fight against cancer at the age of eight. 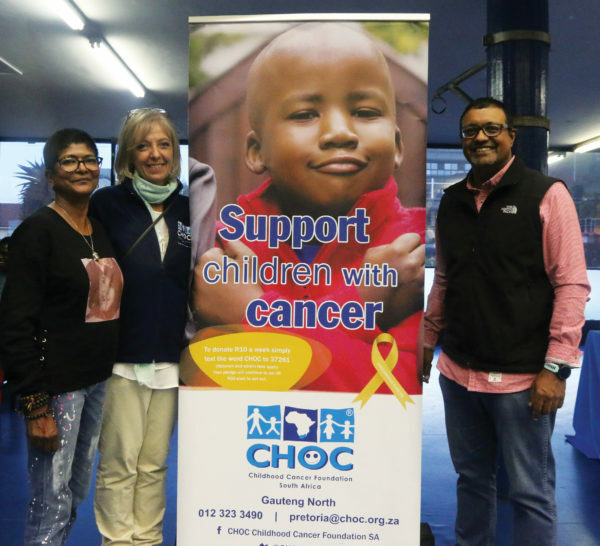 “She would’ve been 30 in 2019… CHOC is 40 this year and to keep my daughter’s memory alive, the dream is to raise R300 000 for CHOC and this is one of the drives that help,” Mathen said. The cancer organisation raised R16 500 through entry fees, while attendees of the tournament, teams and other donors donated money resulting the tournament to raising a total of R51 500 for CHOC. Candice Govender, QVC captain said CHOC will host another similar volleyball tournament in June and July.